I just hope some of the "Made in Canada" versions end up on the market or at Pensgear for a reasonable price. I remember finding a 2010 WC Style Malkin Made in Canada jersey in Pensgear. That was a nice find. I hope the same is true for the Adidas versions. There is a nice Penguins UnderArmor long sleeve shirt that I have only seen at the arena. Trouble is they want $100 for it. Anybody know if these are available online anywhere? I need some help. I have the Fanatics replica. It has an extra stitching across the shoulder Vice the authentic. I’m trying to place the 50 years patch but am unsure how to place it on this jersey. Not sure if it would cause problems to place the patch on top of the seam? Anyone have any experience ie measurements from the center-top of the yellow? Firebird wrote: I need some help. I have the Fanatics replica. It has an extra stitching across the shoulder Vice the authentic. I’m trying to place the 50 years patch but am unsure how to place it on this jersey. Not sure if it would cause problems to place the patch on top of the seam? Anyone have any experience ie measurements from the center-top of the yellow? Firebird, the problem you're running into is the fact that last year's Reebok jerseys and this year's Adidas jerseys are cut differently. 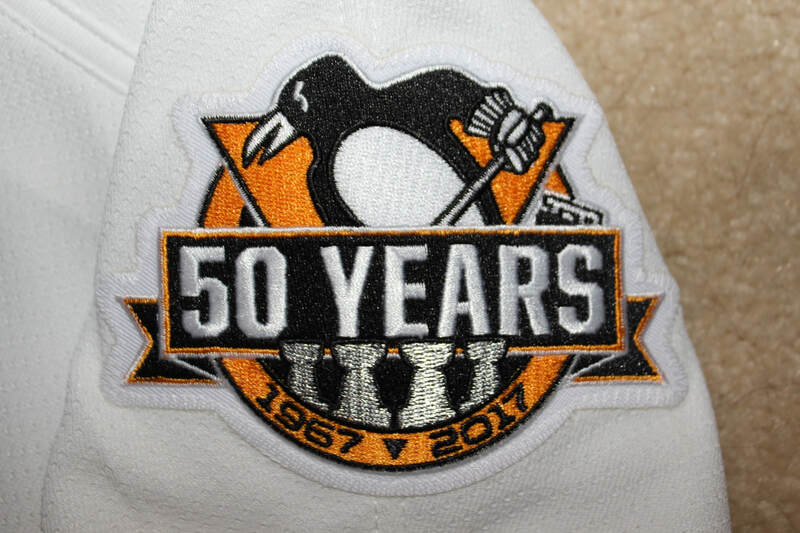 I'm reading your post to mean that you're concerned that the 50 Years patch won't sit right with a horizontal shoulder seam being underneath it. This shouldn't be a problem. It's tough to see in the photo (https://jeffshly.weebly.com/uploads/4/7/7/1/47713979/img-0016_5_orig.jpg), but my Schultz jersey actually has a shoulder seam that runs vertically right through the center of this patch. As long as it's sewn on properly, you shouldn't have an issue. Right, I also have a horizontal seem (so one both ways). Firebird wrote: Right, I also have a horizontal seem (so one both ways). You still shouldn't have a problem. Those patches can be ironed on first, then sewn on. Are you doing this yourself or taking it to a shop to have done? If you're having this professionally done, by whom? I always recommend the House o' Hockey in Murrysville. They've customized a bunch of my jerseys and I've always been happy with the results, including the patchwork on my Schultz and Maatta jerseys that included the 50 Years patch. we're coming to the Burgh for the games MLK weekend. is House O'Hockey worth an in-person visit if we have enough time to kill? any other great places to get Pens merch outside of PensGear stores? shoeshine boy wrote: we're coming to the Burgh for the games MLK weekend. is House O'Hockey worth an in-person visit if we have enough time to kill? any other great places to get Pens merch outside of PensGear stores? It depends on what you're looking for. HoH is a hockey shop. They primarily sell equipment and jerseys. If you're looking for a jersey lettered to team spec, that's the place to go. If you looking for t-shirts and souvenirs, there are a lot of places closer to downtown. I'd recommend the shops at Station Square. Has anyone picked up any of the Pens set 1 gamers who'd be willing to give us a comparison versus Adizero retail authentics or Reebok Edge 2.0's? jeffshly wrote: Has anyone picked up any of the Pens set 1 gamers who'd be willing to give us a comparison versus Adizero retail authentics or Reebok Edge 2.0's? Not I. Prices have gotten insane. Sorry it's taken so long to post the jersey. I really like it and it was in really great shape! It's one of my personal favorites by far. I would have attached the photos here, but haven't been able to do so. Below are the pics on my public flickr. Sorry for the inconvenience. On a side note, I've started branching out into the minor league teams as well. It's been hard to find good WBS Pens jerseys too. Really good looking jerseys! Congratulations!! oharman wrote: On a side note, I've started branching out into the minor league teams as well. It's been hard to find good WBS Pens jerseys too. I know that many of the WBS game-worn sets are sold by the WBS Pens on eBay. I've picked up a few WBS gamers there, including one from the Pens 2011 Black & Gold Game, that came with a nice (lie: it wasn't nice at all!) little surprise! I'll have to keep checking ebay, I may get lucky and find one I like that fits. Now you got me wondering....what was the nice (not) surprise if you don't mind me asking. oharman wrote: I'll have to keep checking ebay, I may get lucky and find one I like that fits. oharman wrote: Now you got me wondering....what was the nice (not) surprise if you don't mind me asking. I received the jersey two weeks after the game. It was sent to me unwashed. The smell of two-week old Niskanen sweat permeated my house very quickly, to the point that we had to open all of the windows on an unseasonably cold day. My wife wasn't very pleased! Any news on the on ice authentics by adidas being sold as retail next year or by the baron? Lesky wrote: Any news on the on ice authentics by adidas being sold as retail next year or by the baron? Not that I'm aware of. Only option I'm seeing for on-ice Adidas authentication is the game worn jerseys sold by J & J Distributing. I just received Ian Cole's Set 1 road backup jersey from the 2017-18 season. This jersey wasn't game worn, but was prepared for Cole as the team typically does for enforcers - an extra jersey in the event that his gamer is either ripped or blood-stained in a fight. These jerseys runs really small compared to other styles. As an example, a CCM/Koho 6100 series jersey in a size 52 would fit me. When Reebok Edge came out wit the slimmer torso, I wore a 54 or 56. This Adidas jersey is a 58 and it fits me well, though I wish the sleeves were about 1/2" shorter. The shoulders offer more reinforcement that the Reebok Edge 2.0, and the armpits are a ventilated mesh. The sleeves and torso of the jersey are a material that is lightweight, like the Edge 1.0, with a little less elasticity, though much thinner (and, presumably, less durable) than the Air-Knit used on the Edge 2.0. 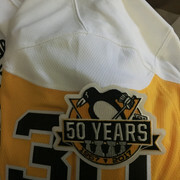 Since this jersey was a Set 1 jersey, it had the NHL100 patch on the right sleeves, though that patch was removed so that it could be used, if needed, once the Pens Set 2 jerseys were in use. If you look closely, there's a faint outline where the NHL100 patch used to be. Personally, I like the striping at the bottom hem of the jersey that runs in a concentric arc to the hemline, as opposed to the single-color tail on the Reebok Edge 2.0. Since there four stripes on the white jerseys, instead of only three on the black jerseys, the bottom stripe is narrower. Typically, the team has its game-worn tag centered on that bottom stripe in the tail, but the narrowing of that bottom stripe on the white jersey required moving the game-worn tag alongside the fight strap. All in all, I like these jerseys better than I thought I would, though I'm still partial to Air-Knit and, better yet, Ultrafil, but I'm old! I'll update my website (http://jeffshly.weebly.com) with pictures and a story as time permits in the coming weeks. I got around to updating my website, with pics included for all, including the Ian Cole Adidas jersey mentioned above, a really cool Markus Naslund Cleveland Lumberjacks gamer (WHAT?!?!? ), and my latest find, a John Cullen rookie year practice jersey. Check 'em out and let me know what you think at https://jeffshly.weebly.com/. ...and Fanatics are NOT known for their quality...ugh. Well, I'm sure that decision comes down to dollars and cents for the league. I'm not a fan of their product, either. I've always found it to be overpriced crap that doesn't hold up well. But I have so many Pens hats and t-shirts that I'm not really looking to buy more anyway. Jerseys, on the other hand...I'm always looking! But I won't be buying any of the Fanatics crap jerseys, either! I'm looking to purchase a blank 2017 Reebok Edge 2.0 7287 Pittsburgh Penguins Jersey (home or away). Do any of you know places/people who sell them? Keep in mind that I'm already away of the seller Jersey Baron on eBay. I purchased a Stadium Series jersey from Ice Jerseys. I bought it blank in case I wasn't happy with the size. They are located in Canada and sell the Canadian made jerseys. I had it numbered at Pro Knit Sports Wear in Pittsburgh. The same folks who do the lettering for the Pens. I'm sure there are more sellers, but besides Ice Jerseys and Jersey Baron, I haven't purchased authentics from anyone else. I bought my wife an authentic Adidas 3rd Jersey from Pens Gear on their Cyber Monday sale. I'm pretty disappointed in the fact they used fake layered numbers and they aren't all twill. I'm going to return it, but that leaves me in a bind not having the Jersey I want. I bought one too and agree with you regarding the numbers. I thought the material was pretty thin too (not sure if that's part of the change on the real ones or not), but I do like the look of the new 3rd and will just keep it. I don't forsee me buying any more of them though. Also as far as sizing goes, I have size 56 Reeboks that fit fine and went with a 60 on the Adidas. I'm glad I did because it fits like my 56 but a tad bit longer in body length.